The Joseph Smith Papers Project is a collection of primary Joseph Smith documents that is invaluable to American history scholars, Mormon history scholars, and of importance to members of The Church of Jesus Christ of Latter-day Saints. Histories, Volume 2: Assigned Historical Writings, 1831-1847 is the latest volume in the series and covers histories assigned, but not overseen, by Joseph Smith. While Volume 1 contains histories written, dictated, or supervised by Joseph Smith, he also assigned several associates, including John Whitmer, William W. Phelps, John Corrill, and Edward Partridge, to write church histories. Their writings-vivid, personal, and sometimes surprising-are found in this second volume of the Histories series, which provides a rich, multifaceted view of the early years of the Latter-day Saint movement, particularly the Missouri Mormon War of 1838. Two of the histories found in Histories, Volume 2 were originally published in Latter-day Saint newspapers: William W. Phelps's "Rise and Progress of the Church of Christ" and the Times and Seasons series "A History, of the Persecution, of the Church of Jesus Christ, of Latter Day Saints in Missouri." Whitmer and Corrill both left the church before finishing their histories. Most of Whitmer's history was composed in the words of a faithful Latter-day Saint, but Whitmer wrote the final three chapters of his history after his 1838 excommunication, and the manuscript closes in a critical tone. After Whitmer declined to turn over his history in 1838, Joseph Smith assigned Corrill as a church historian. Within a few months, Corrill also distanced himself from the Saints. The history he published became personal as well as institutional, laying out "the reasons of the author for leaving the church." Like Whitmer's history, Corrill's gives readers a better understanding of the anxieties and difficulties experienced by some early converts to the faith. It also offers a detailed look into the conflicts and dilemmas confronting Joseph Smith and other leaders as they worked to create a unified community of Saints. The publication of The Joseph Smith Papers two centuries after the birth of the founder of The Church of Jesus Christ of Latter-day Saints opens a window on a life filled with what he called "marvelous experience." Despite having received little formal schooling, Joseph Smith left an extensive legacy of letters and other written records which is now being made widely available. The Joseph Smith Papers series is expected to span about twenty volumes in total. Histories, Volume 2 is the seventh published volume in the project. Visit JosephSmithPapers.org for more information about Histories, Volume 2 and other Joseph Smith Papers Project publications. The website also includes several documents that directly supplement the material in Volume 2. 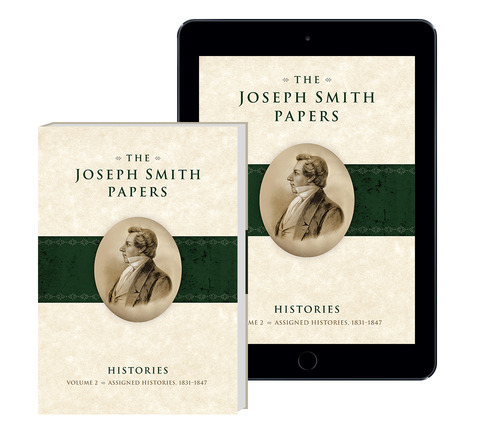 The Church Historian's Press announces that the second and final volume of the Histories series of The Joseph Smith Papers is now available for purchase. The volume is titled Assigned Histories, 1831-1847. The volume's editors are Karen Lynn Davidson, Richard L. Jensen, and David J. Whittaker. Like Histories, Volume 1, this volume includes documents that were specifically written to narrate the story of the Church of Jesus Christ of Latter-day Saints. The results are highly readable accounts that provide details found nowhere else about key events from JS's life and the early church. While Volume 1 contains histories written, dictated, or supervised by Joseph Smith, he assigned several associates, including John Whitmer, William W. Phelps, John Corrill, and Edward Partridge, to write church histories. Their writings-vivid, personal, and sometimes surprising-are found in this second volume of the Histories series, which provides a rich, multifaceted view of the early years of the Latter-day Saint movement, particularly the "Mormon War" of 1838. A revelation in 1831 assigned John Whitmer to write the church history, a project he worked on periodically for more than fifteen years. His manuscript weaves together copies of important letters, revelations, petitions, and other documents with his own narrative. Most of Whitmer's history was composed in the words of a faithful Latter-day Saint, but Whitmer wrote the final three chapters of his history after his 1838 excommunication, and the manuscript closes in a critical tone. After John Whitmer declined to turn over his history in 1838, Joseph Smith assigned John Corrill as a church historian. Within a few months, Corrill also distanced himself from the Saints. The history he published became personal as well as institutional, laying out "the reasons of the author for leaving the church." Like Whitmer's history, Corrill's gives readers a better understanding of the anxieties and difficulties experienced by some early converts to the faith. It also offers a detailed look into the conflicts and dilemmas confronting Joseph Smith and other leaders as they worked to create a unified community of Saints. Also included in Histories, Volume 2 are two histories published in Latter-day Saint newspapers. The first, a short article titled "Rise and Progress of the Church of Christ," was written by William W. Phelps in 1833 in response to a request by Joseph Smith to make The Evening and the Morning Star more interesting to readers. The second originated after the "Mormon War," an extended armed conflict between the Mormons and their neighbors in northwest Missouri that resulted in the Mormons being expelled from the state and Joseph Smith being incarcerated. In March 1839 he wrote a letter from prison instructing church members and -Bishop [Edward] Partridge in particular- to document the sufferings and abuses experienced in Missouri. In response, Partridge wrote a detailed eyewitness account that was published serially in the church's newspaper, the Times and Seasons. The series, titled "A History, of the Persecution, of the Church of Jesus Christ, of Latter Day Saints, in Missouri," also drew on previously published accounts of the Saints hardships, including writings by Sidney Rigdon and Parley P. Pratt. The documents in this volume are carefully transcribed and are contextualized with annotation and illustrations. The volume also has extensive reference material, including biographies of the people mentioned in the documents, maps, a glossary, and a detailed chronology. It also contains the cumulative index to volumes 1 and 2. With the publication of Volume 2, the letterpress edition of the Histories series is now complete. The balance of the Histories series, published electronically at the Joseph Smith Papers website, will present the entirety of the massive multivolume history initiated in 1838. Volumes one and two of that history are already available online. The website also features supplementary material to volumes 1 and 2, including source texts for the documents found in the published volumes. As with all other volumes of The Joseph Smith Papers, the documents contained in Volume 2 will be posted on the project website at a future date. 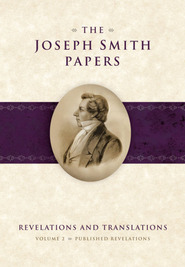 This volume, along with all previously published volumes of The Joseph Smith Papers, is available for purchase through Deseret Book Company, the distributor for the project, and many other booksellers.